WATCH: MICKEY'S FD RX-7 BLEW UP ON THE DYNO... SERIOUSLY. This is not clickbait. 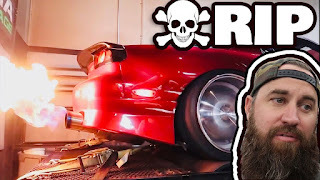 Mickeys FD RX-7 blew up on the dyno! It is a sad day for the RX-7 but the boys aren't wasting anytime with the car and are starting the rebuild ASAP. Check out the video to see why the car blew up.